Tennille Wood worked with one client to re-envision both a bar and wine cellar in their basement as well as a fabulous master bathroom renovation. The glass-front wine cellar is now perfect for displaying the client’s private collection and the bar area is better suited for entertaining and family gatherings. The reinvigorated master bath retreat is now a luxurious oasis for relaxation featuring many high-end amenities. This high-end basement bar and wine cellar is guaranteed to impress guests during any dinner party or family gathering. Floor-to-ceiling glass windows and door makes the space appear larger and showcases the client’s collection in an eye-pleasing way. The floating bottle racks are functional as well as beautiful. The remarkable stone wall is made from stacked stone of quartzite which adds both texture and interest to the private wine cellar. The floating wine racks leave the cellar floor open and allows for the display of the beautiful wooden boxes which were thoughtfully collected from the client's favorite vineyards. Wood transformed a barrel the clients purchased from one of their favorite wineries into a custom-designed table. Now it is the perfect conversation starter! The incredible master bath now feels like a relaxing spa with its warm details and luxurious, high-end amenities such as aromatherapy, chromotherapy and Bluetooth speakers, heated floors and benches, and a rain can shower head. An inlaid, mosaic stone border on the floor breaks up the large expanse of open space and also highlights the other carefully-designed mosaic elements placed throughout the bathroom. A versatile curbless shower design offers a barrier-free, luxurious presentation. In addition to being beautiful, curbless showers are functional options for older couples looking to stay in their forever home. Wood designed the mosaic stone elements to repeat throughout the room in order to create a harmonious relationship between all elements and colors that really ties the space together. 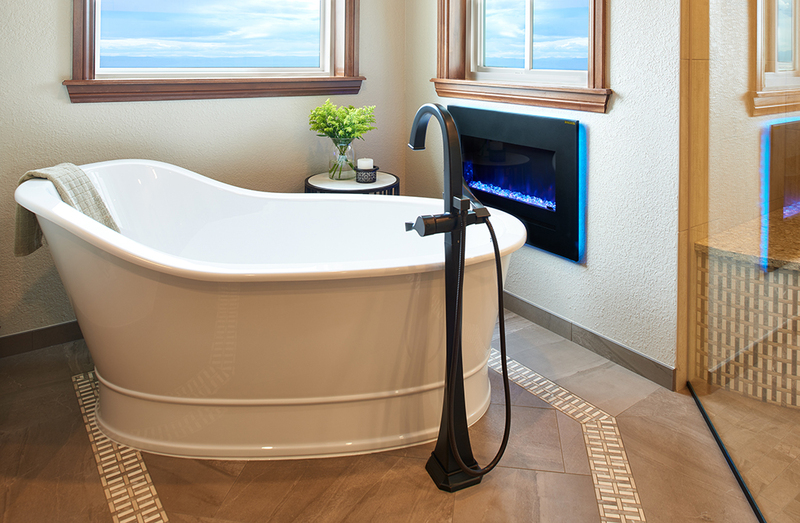 The sculpted bathtub features an incredible free standing, oil-rubbed bronze tub filler. The nearby in-wall fireplace adds warmth and ambiance. Wood and her team opted to replace a Jacuzzi bathtub for a more sleek and sophisticated tub design that is not only eye catching, but perfect for relaxing.